I went all the way to Centre Rockland to try the newMandy's last week. Technically, it's not a new location but simply their food truck that was relocated to the shopping mall during the winter season. What a smart idea, right!? I feel like this could be done with so many food trucks and indoor locations in Montreal. 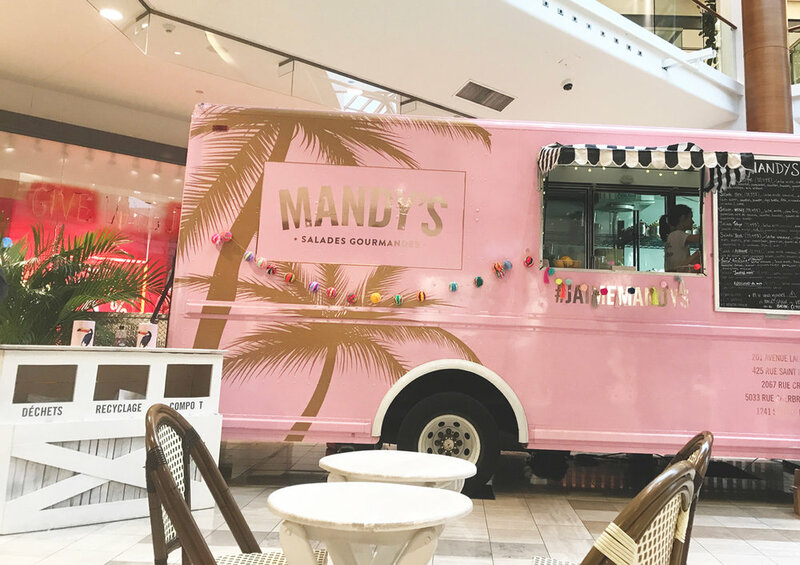 The women behind Mandy's have always been amazing at interior design. They found a way to turn a simple mall open space into its own little oasis. They didn't shy away from bringing their signature marble tables and chairs, even the branding on the garbage bin is awesome ah (and props for composting)! For lunch, I decided to try the salad named Déesse Rockland, a special only found at Centre Rockland. I've never had a boring salad at Mandy's and this one was probably the best one I have ever had from them! I washed it down with Montreal-made Kombucha Fous de L'île. You have to try their turmeric flavour if you haven't yet! They even treated me with one of their famous chocolate chip cookies which I ate a few hours later with the rest of my salad because their portions are huge! Afterwards, I indulged in a little shopping session. Frankly, Centre Rockland is the mall that I prefer in Montreal and I would visit more often if I would own the fact that I finally have a driver's license. I hold it close to my heart because I used to visit it monthly with my family as a kid. My dad loved to drive us there! With everything that's been happening with my parents' health, it makes me happy to think of when things were easier and we could all have a good time together. Centre Rockland has been making a lot of efforts to modernize the mall with pretty exciting brands opening every season and an upcoming redesigned food hall. I visited a few of my staple stores and ended up buying a martini kit at SAQ and finding my winter boots at SoftMoc, a pair of beautiful black Blundstone Boots!